Santouka Ramen – Vancouver | how's it going, eh? Let’s go eat ramen in Vancouver!!!!! Yum, yum, yummerrrrrrsssss!!!!!! When my mom + big sis Ashley flew up from Los Angeles before the holidays, I was constantly bragging about all the great Asian food one’s belly could consume in Vancouver. I had been wanting to try out Santouka Ramen on Robson since I’ve been reading so many good things about it! My mom was like, “Yes, please!”. Hai! Okay!!!! Ramen Attack!!!! Santouka Ramen opened up it’s first shop in Japan’s most northern island, Hokkaido. Now it is a chain with TONS of shops all over Japan!!!! In addition, there are also locations in the U.S., China, Malaysia + Indonesia! Look them up! When we arrived at Santouka, there was a pretty long line up. Yick. 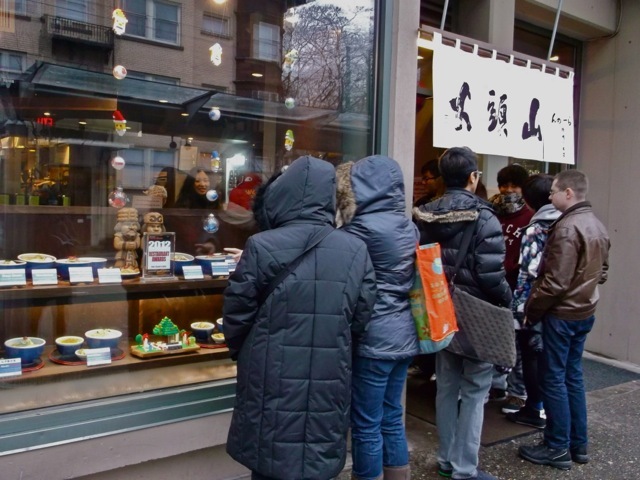 Wait, who are these mysterious hooded figures drooling at the Japanese plastic food displayed in the window? Lost Hobbits???? 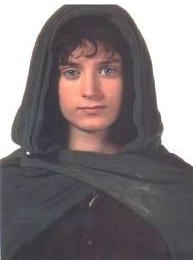 Frodo??? Do you eat ramen in The Shire??? Oh hey Ashley! Hey mom! As you can see they’re the only ones in line with their hoods up. Protecting themselves from “the elements”. Otherwise known as “a light mist”. Crazy Californians!!!! It was a significantly long wait, but when we were seated, our order was immediately taken + the food followed shortly after! Hai! Japanese efficiency!!! Hai!!!! After all the hype, my mom decided not to order ramen + ordered a vegetable stir fry + the Ikura (roe) Bowl. Go figure! My sister ordered the Cha-shu Miso Ramen. As you can see – she is very happy about her decision! I ordered their famous Toroniku Ramen! Toroniku is melt in your mouth pork cheek! Woah! It also came with a slice of kamaboko, (fish cake) green onion, bamboo shoots + wood ear mushroom. I ordered a side of eggy wegg. My sister actually preferred her Miso Ramen to my fancy schmancy one, as she thought her pork was juicier! I think I might stick with the classic Cha-shu Miso Ramen next time! Nevertheless, DELICIOUS!!!! A tremendous difference from the “ramen” I had at Shikiji in Calgary!!!!! My faith is renewed in Canadian ramen!!!! 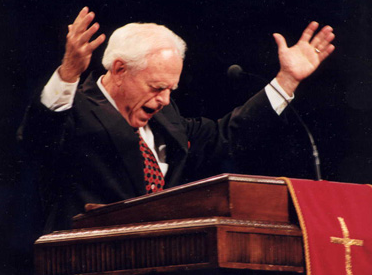 Hallelujiah!!!!! 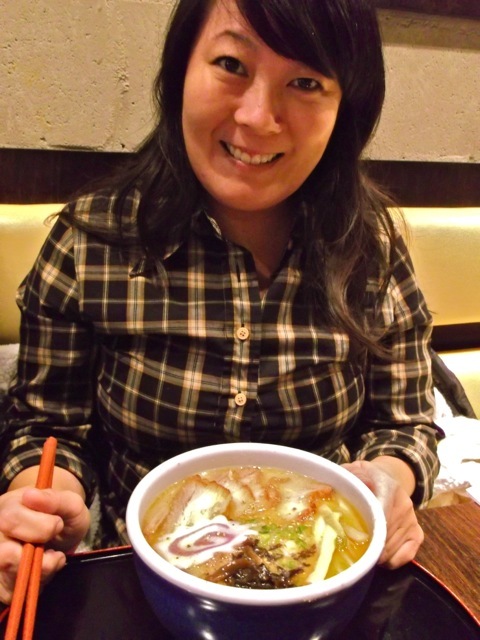 Mom made an interesting observation + said that she found the broth to be too strong + thick. 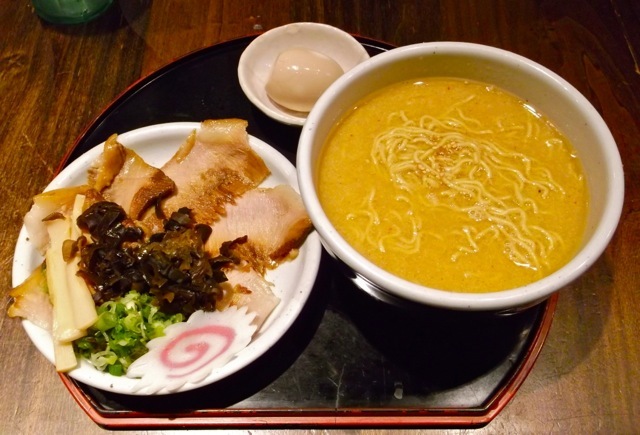 Popular ramen shops even in Los Angeles have been featuring this really rich, thick, porky broth. 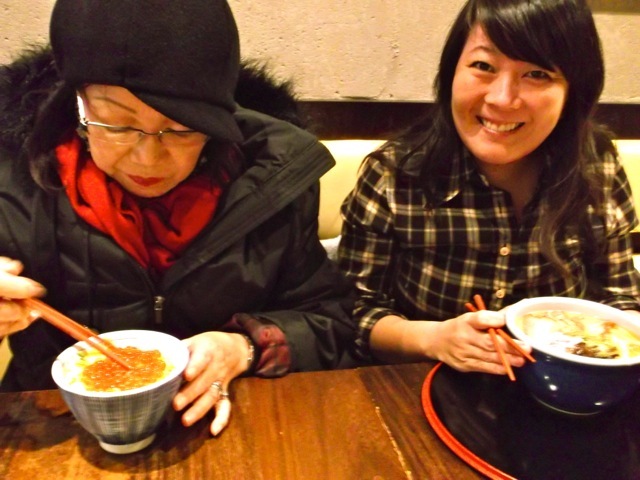 Mom is old school + likes her broth light + thin! 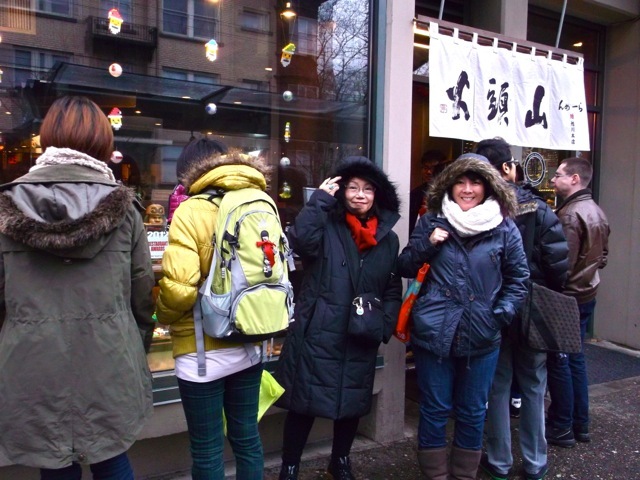 As we were getting ready to leave, we noticed that there was no longer a line + the restaurant wasn’t as packed. Note to self, go to Santouka after 2:30pm!!!! Although Santouka is a massive chain restaurant, the food is top notch! They definitely have not lost anything in terms of taste + good service! 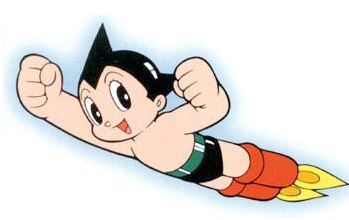 ARIGATO GOZAIMASU!!!!! Yeah dad! Click on the link + check out Santouka Ramen! They have locations in the South Bay!!! Go visit one with mom!